Social media influences and permeates many aspects of daily life for Americans today, and the workforce is no exception. These digital platforms offer the potential to enhance worker productivity by fostering connections with colleagues and resources around the globe. At the same time, employers might worry that employees are using these tools for non-work purposes while on the job or engaging in speech in public venues that might reflect poorly on their organization. As noted above, 17% of workers say they use social media to build or strengthen personal relationships at work – but the transparency that social media facilitates comes with costs as well as benefits. Some 14% of workers have found information on social media that has improved their professional opinion of a colleague; at the same time, a similar share (16%) have found information on social media that has lowered their professional opinion of a colleague. Younger workers are more likely than their older counterparts to say they have discovered information about a colleague on social media that lowered their professional opinion of them – but also are more likely than older workers to have found information that improved their professional opinion of a colleague. 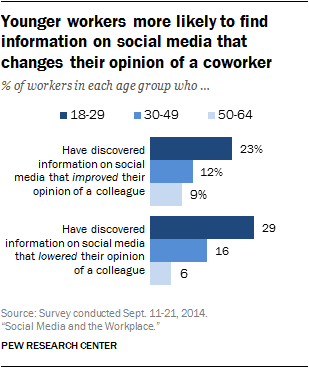 Some 23% of workers ages 18 to 29 report that they have discovered information on social media that improved their professional opinion of a colleague. By comparison, just 12% of workers ages 30 to 49 and 9% of workers ages 50 to 64 have experienced this. Similarly, 29% of these younger workers have discovered information that lowered their professional opinion of a colleague: 16% of those ages 30 to 49 and 6% of those ages 50 to 64 indicate that this has happened to them. Many workers report that their employers have policies about social media use on the job, or about how employees may present themselves in various online spaces. Half of all full-time and part-time workers (51%) say their workplace has rules about using social media while at work (45% say their employer does not have these policies), while 32% report that their employer has policies about how employees may present themselves on the internet in general (63% say their employer does not have these policies). Policies that regulate how employers present themselves online outside of work may be expected to influence whether these workers use social media at all. However, this does not seem to be the case: Fully 77% of workers report using social media regardless of whether their employer has such a policy in place. 30% of workers whose companies have an at-work social media policy say they use social media while on the job to take a break from work, compared with 40% of workers whose employers do not have such policies. 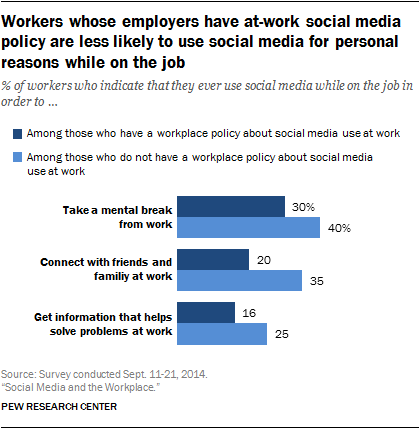 20% of workers whose employers have at-work social media policies say they use social media to stay connected to family and friends while on the job, compared with 35% of workers whose social media use is not regulated at work. Only 16% of workers whose companies regulate social media at work say they use social media while working to get information that’s helpful to their job, compared with 25% of those whose workplaces have no such regulations. 19% of workers say they ever use Facebook for work-related purposes. 14% ever use LinkedIn for work-related purposes. 3% ever use Twitter for work-related purposes. 9% use a social media tool provided by their employer for work-related purposes. 5% use social media platforms other than the ones listed above for work-related purposes. 78% of workers who use social media platforms for work-related purposes say social media is useful for networking or finding new job opportunities. 71% of these workers say social media is useful for staying in touch with others in their field. 56% say it is useful for connecting with experts. 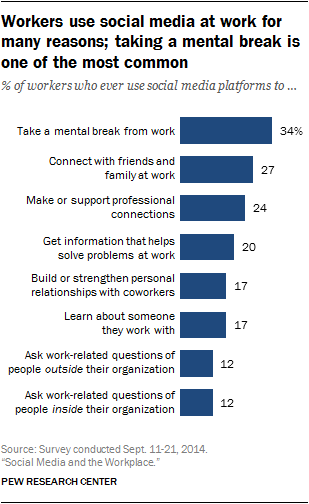 51% say it is useful for getting to know their co-workers on a personal basis. 46% say it is useful for finding information they need to do their job. 56% of workers who use social media platforms for work-related purposes agree that social media distracts from the work they need to do, with 30% agreeing strongly. Some 42% of these workers disagree that social media is a distraction. 54% of these workers agree that social media breaks help them recharge at work. A statistically similar proportion (46%) disagree that social media breaks help them recharge while on the job. 51% of these workers agree that social media use at work lets them see too much information about their coworkers; 47% disagree with this statement. In the end, a majority (56%) of these workers believe that using social media ultimately helps their job performance. One-in-five (22%) believe that it mostly hurts, 16% feel that it doesn’t have much impact either way and 4% see both the benefits and the drawbacks. Even as the internet has embedded itself in numerous aspects of American life, many of today’s workers make only marginal use of the internet for accomplishing work-related tasks. 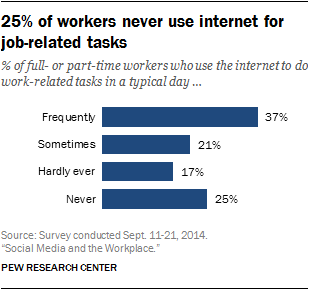 Indeed, some 17% of workers report that they “hardly ever” use the internet on a typical day for work-related tasks, while 25% report that they “never” use the internet for this reason.